Let me preface this post by saying that in all reality, hearing loss is NOT a total shock (or it shouldn’t be) when a child also was born with cleft lip and palate. In fact, I asked the audiologist we saw today and she confirmed to me that many of her patients have cleft lip and palate. Our ENT has told me as well that the same time mouths are forming in utero, so are the ears inside and out. It is NOT uncommon for the two to go together: cleft lip and palate and hearing loss. I always said when looking at the checklist. You know the one if you’ve ever had to fill one out: the special needs checklist. Sure, agencies have varying ones, but they are all about the same. Check the Yes boxes for needs you are open to and if you’re not open to a need, just leave the Yes and Maybe boxes for that need blank. And The Prez and I, we didn’t even check the Maybe box. Much less the Yes box. Then you realize when your child comes home and is faced with hearing loss—permanent and congenital hearing loss—you are all of a sudden not only open to the need but you find yourself on a mission to learn all you can at a supersonic pace. You see, our Li’l Dude—he can’t hear in his left ear. Much at all. He is hard of hearing at best in that ear. The image below shows his hearing levels in each ear. The left ear—in blue—shows he can barely hear a vacuum cleaner. The audiologist explained in a noisy place, he wouldn’t even hear that. Voices or talking … he can’t hear that. Birds chirping … no. A baby crying … barely maybe. After his CAT scan of his ear and the follow-up ENT appointment, it was time to swallow hard and move forward. The ENT explained to me that our Li’l Dude’s left ear was malformed inside. He explained to me things like nerves in the wrong places, fused bones, cochlear just fine … to be honest, after being at the hospital for 4 hours with Li’l Miss’s bi-annual cardio appointment before the ENT follow-up and trying to digest it all … I was spent. That was a couple of weeks ago though. Now I have moved forward and onward. Talked to some other Moms of children with BAHA devices, hearing loss and mainly I’ve accepted that this new diagnosis does NOT change who our little boy is and who he will be. While this is yet another set of appointments and specialists we will add to our repertoire of hospital visits and all that involves, I am yet thankful we have options. And while this does affect our Li’l Dude, this need does NOT define him. Today, he tried on a temporary BAHA device. He seemed to really enjoy the difference. The audiologist did a brief test with his right ear plugged. 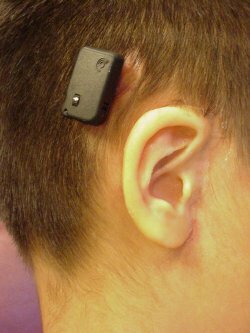 She then performed a series of hearing test on his left ear with the BAHA on his head and without it. The difference: AMAZING and profound. Our next step is scheduling a surgery date with his ENT for the procedure. He will have a small screw-type holder deal implanted on his head. This will be where we will attach the BAHA. The photo below shows a child wearing the same type of device our Li’l Dude will wear. Since he is already 5, he is a candidate for the permanently fixed BAHA. Here is a picture of what it looks like when the device is attached (goal is to wear during all wake hours; off only to sleep, bathe, swim). We also confirmed today that the audiology team agrees with our ENT that a traditional hearing aid would first of all probably not lend much help to our Li’l Dude in improving his hearing and secondly, would most likely not stay in his ear. That leads me to what brought about in part my panic in China. I have never talked in much detail about it, though I reference it in this prior post here on NHBO. I immediately noticed our Li’l Dude’s ears looked *different* when we met him in China. I remember distinctly thinking to myself: we didn’t sign up for major hearing issues and his ears just look weird. What I didn’t know then is what to call the look of his ears: ear canal stenosis. I knew the word stenosis meant narrowing because of our heart journey with Li’l Miss but I didn’t know it could apply to ear canals. I know this sounds terrible and it feels even more terrible to type it out, but it is the truth. I was so worried about his ears and what the outer look might mean for the inside of them. Thankfully, the Prez more or less told me to get over it and we’d deal with it when we got home. Today, at our 12-month post-placement visit as we told our SW about the latest medical development concerning Li’l Dude’s hearing, the Prez and I remembered aloud how panicked I was and how adamant he was that no matter what, our Li’l Dude who we had quite frankly fought so hard to adopt WAS COMING home. It was not so much that I doubted this fact or even considered questioning it. The Prez and I agreed early on in our adoption journey that when we said no matter what, we meant it. So that part was easy. We had agreed we’d not make a decision in China we might one day regret and would forever doubt. But those ears, they sure nagged at me. To top it all off, Li’l Dude was dealing with the nastiest and meanest ear infections we’d ever seen. And he didn’t talk at all. For 2 solid weeks. I doubted he ever would. Now I figure not only was he in shock, but he most likely couldn’t hear anything or at the very least muffled voices that sounded funny. Fast forward nearly one year from the day we met—June 21, 2010—and Li’l Dude is speaking in sentences and even paragraphs! While we understand a lot of it, most people don’t. We are hopeful that his speech journey and hearing journey will only improve with the addition of his BAHA device. And while I once thought his precious ears looked weird, I now see them as just about perfect! You will maybe be able to see the canal stenosis our Li’l Dude has in this photo below of his right ear: in his case, the ear is formed completely but the ear canal itself is extremely narrow which in itself often affects hearing. In Li’l Dude’s case it affects both his ears, but the bigger need involves the malformations inside his left ear, which the ENT says happened in utero the same time as the clefting occurred. And my advice for those adopting cleft-affected children: please be prepared for the *possibility* that hearing IS affected as well. We are at 100% for that one as both of our cleft-affected children have hearing loss. Li’l Miss though seems to have turned a corner with that since her tubes were placed. Li’l Dude also had tubes but his hearing didn’t improve. Now we know why: congenital malformation of the ear inside and out. As we enter the world of an undisclosed need, I am most thankful for Moms who share so that I can go into this unknown territory better able to handle the unknowns we face and the endless possibilities our Li’l Dude has for his future!